Everybody loves a bride - and no one more than Enda Kenny on an 'Angela Ashes' sort of day in Co Limerick. One can only imagine the total chagrin/utter delight of the groom, Eoin Cuddihy, when he discovered that the Fine Gael think-in was taking place at the same time and in the same venue - the delightful Dunraven Arms Hotel in Adare - as his wedding reception. For Eoin, you see, works in the Department of the Taoiseach. So effectively his boss was turning up at his wedding. Still, at least it spared the bride, local woman Kate Donegan, from having to hunt out 'something blue' to sport, in keeping with tradition. And so yesterday as the rain fell endlessly, the red carpet was rolled out in anticipation of the arrival of the couple and - quelle surprise - the Taoiseach was spotted hovering in the vicinity of it. But then he did something unexpected - he hopped into his car and departed before the bridal party arrived, leaving a huddle of jilted and sodden photographers in his wake. But sure ... he's already pledged his troth to Joan Burton. Moreover he's a chap who likes to keep those around him guessing as to his next move (or, in the case of the whodunit of the Fennelly Report, trying to decipher moves he's already made). He's having great craic altogether these days, keeping people guessing about things such as the date of the next general election, and just how long he plans to remain enthroned as the head of his party. Certainly at Fine Gael's think-in, any dissidents in the ranks were keeping their thoughts to themselves. None of the troops were invoking the F-word (Fennelly). In fact, Enda was spotted enjoying a convivial breakfast yesterday morning with none other than the former Justice Minister Alan Shatter. "No eggs thrown or citrus juice hurled," reported a colleague who had kept a close eye open for any rash(er) behaviour. And despite his past travails, Alan still attended the social event in the hotel on the previous evening. At one stage he was observed sipping from a red-coloured cocktail. "It's a Bloody Commissioner," said one wiseguy. There was a businesslike air about the two-day group ponder. Simon Coveney arrived straight off a flight from Chicago where he had been on beef business, while Michael Noonan looked bushy-tailed after a bit of a break last month as he dropped hints about the forthcoming Budget. Yet the question of Enda's Exit wouldn't go quietly. During an interview on 'Morning Ireland', the Taoiseach unequivocally put a halt to any rustling in the Fine Gael undergrowth. "I intend to win this general election, to lead the next government and to serve a full term," he stated. And what's more, he wouldn't rule out the 'and beyond' scenario. "God knows what the future holds," he said cheerfully, causing, one suspects, both Coveney and Leo Varadkar to choke on their toast soldiers. The media tried a different tack at the closing press conference. A line of ministers were at the top table with Enda, including Frances Fitzgerald. "Any thoughts on your successor when you stand down? Perhaps a woman?" asked one reporter. "The succession within the Fine Gael party is very carefully laid out in the rules of the party," Enda explained, adding: "It's a long way in front of us". Would the Justice Minister care to comment? Seated beside her boss, Frances spluttered: "I certainly don't." But would Frances always be the bridesmaid and never the bride? "Would you like to be leader?" 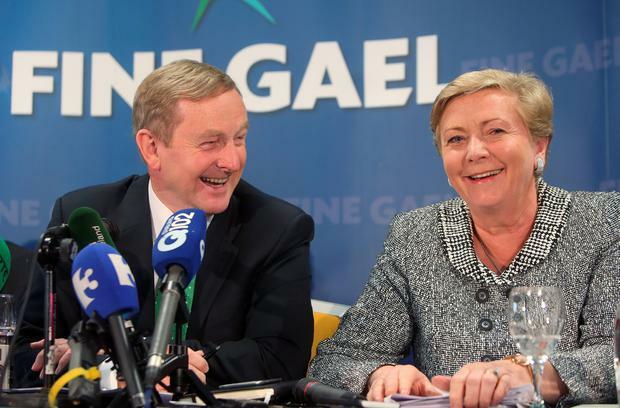 she was asked.Enda turned to his Justice Minister: "Go on, Frances, answer the question," he suggested, with the sharky smile of a leader absolutely sure that a heave was not about to kick off in Adare. Frances rattled out a reply which had the polish of a "here's-one-I-prepared-earlier". "What I would say is, we have the best Taoiseach this country has ever had in Taoiseach Enda Kenny, and the kind of decisions that were taken have saved the country," she recited. "There is no vacancy so the question doesn't arise here." That's that, so. For now. But Enda has plenty to keep him busy until 2020 and beyond - including dealing with stuff such as an outbreak of bonkersness from James Bannon. The Longford TD decided to pick a fight with the capital by demanding that homeless Dubliners should not be sent to the midlands, because the dastardly Dubs visit "social and criminal problems" on the bucolic beauty of Longford. Dear oh dear. There goes the somewhat sizeable Dublin vote. And what precisely Enda will do now with deputy Bannon is anybody's guess.